West Bay Orthopaedic Medical Group - Leslie H. Kim, M.D. Dr. Leslie Kim is a board certified orthopaedic surgeon in active general practice with sub-specialization in shoulder and knee arthroscopy. His special interests include sports medicine, workers compensation, forensic (medico-legal) orthopaedics, and health care innovation. 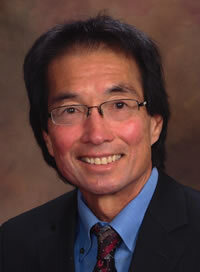 Dr. Kim is a graduate of Stanford University and Stanford Medical School. He completed general surgery internship and orthopaedic surgery residency at UCLA. He also received post-graduate fellowship training in arthroscopic surgery, orthopaedic trauma in Munich Germany, and reconstructive surgery at Scripps Clinic. Following Dr. Kim's formal training, he gained additional experience while working at the Olympics and serving as a local college team physician, as well as expertise in the workers compensation system as the medical director of a large statewide medical group. Dr. Kim is presently the chair of the orthopaedic surgery department at Mills-Peninsula Hospital in Burlingame, and on staff at Seton Medical Center. He has a long standing commitment to numerous state and national organizations servicing the medical profession and community. Physician colleagues have elected him President of the California Orthopaedic Association, President of the San Mateo County Medical Association, Trustee on the Board of the California Medical Association, and Executive Committee member of the American Academy of Orthopaedic Surgeons Board of Councilors. Another ongoing passion of his is the use of information technology to enhance patient-centered health care. His experience in this area date from college honors research on a mainframe computer at Stanford to his current involvement in telehealth and cutting edge health apps/sensors for patient engagement. Outside the office, Dr. Kim is a sports fitness and physical conditioning enthusiast, who has participated in competitive triathlons and marathons. Having been born and raised in Hawaii, he enjoys a variety of water sports and outdoor activities, ranging from sailing and diving to skiing and trekking in the Himalayas. Curriculum Vitae for Leslie H. Kim, M.D. Chief Medical Officer, KuraMD, telehealth company. Medical Director and founding board member, Northern California Orthopaedic Medical Group, 1998-2009. Board of Directors, Executive Committee, Mills-Peninsula Medical Group, 2005-2014. Research Assistant, Palo Alto Veterans Hospital, 1974. Development of Quantitative Staining Techniques. Research Assistant, Stanford University Medical School, Division of Plastic Surgery, 1977-1978, Fascicular Microsurgical Nerve Repair Techniques. Computer Analysis of Rhythm Entrainment, Stanford University, Biology Honors Thesis, 1974, Falconer Bioscience Library. Results of Revisions for Aseptic Failed Knee Arthroplasties, Kim, L. and Finerman, G., presented at the American Academy of Orthopaedic Surgeons Annual Meeting, March 15, 1983, Anaheim, California), Orthopaedic Transactions, Volume 7, Number 3, p. 535, 1983. The Effect of Total Knee Arthroplasty on Tibial Rotation and Quadriceps Forces, Kim, L., Colwell, C., (presented at the Annual Orthopaedic Research Society Meeting, San Francisco, California, 1987), Transactions of the Orthopaedic Research Society, 1987. Arthroscopic Evaluation and Treatment of the Previously Operated Knee, Christie, W., Kim, L., and Sprague, N., Arthroscopy, The Journal of Arthroscopy and Related Surgery, Vol. 4, p,194-199, 1988. Reference Pricing: What does It Mean to You and Your Practice, Leslie H. Kim, William Kumler, and Alexandra Page, AAOS Now, January 2014. Two Ways to Achieve Hospital-Physician Alignment, Craig P. Mahoney, Leslie H. Kim, and Kyle Shah, AAOS Now, September, 2015. © West Bay Orthopaedic Medical Group, Inc.